Are you looking for an easy and inexpensive craft that will help add a festive cheery to your holiday decor? I'll show yo how to make these easy Christmas scrapbook paper coasters! Learn how to make a grateful sign for Thanksgiving! If you like the rustic accessories to add to your home decor, these easy and inexpensive Thanksgiving Coasters are the perfect project! Looking for a beautiful and inexpensive centerpiece for Thanksgiving? With a little makeover of Dollar Tree pumpkins, you can make your Thanksgiving table extra festive! I found a brain jello mold at the dollar store and decided to use it to make a brain candleholder for Halloween. Halloween may be over for this year, but it's never too early to start planning for next year! Here is the video tutorial, so you can see exactly how I made it! 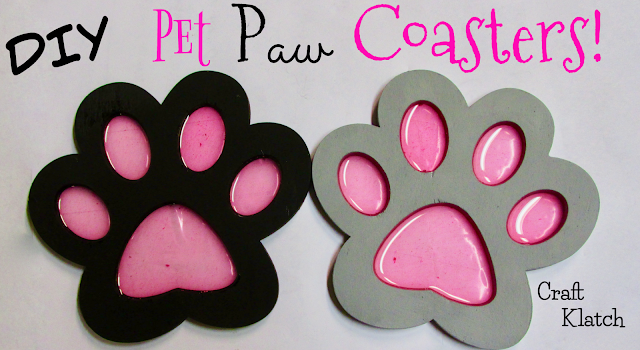 If you love your pets as much as I do, you probably like making stuff to honor them. I have two kitties and I happened upon these paw cut outs and thought it was a perfect opportunity to make one in honor of each. The gray one is for Spooky and the black one for Pouffy. Continuing with the Disney Princess coasters, today we are tackling Snow White!!! I concentrated on Snow White and the evil stepmother, but you can also do the same thing with the seven dwarves.